Multifunction actuator. 4 x 10A outputs / 6 inputs. 2 DIN rail units. 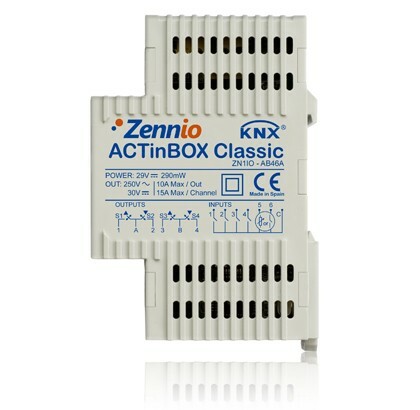 ACTinBOX Classic is a powerful multifunction actuator with 6 inputs and 4 outputs. It stands out for its simplicity and flexibility. IMPORTANT NOTE: This product, ZN1IO-AB46, is no longer under production. Nevertheless, it counts on all the support (manuals and databases updates, spare parts and technical support) that may be required.